Gas prices usually go down in the winter and go up in the summer. This season has been different - gas prices actually went up. I wish I had tips on ways we could take gas companies by storm and drive their prices down, but I don't know that it will work. I'm still brainstorming that idea, but in the meantime, I can only offer some advice on how we can stop using so much gas (a thrifty, and much safer alternative). Here are some practical ways we can all save some cash at the pump. 1. Drive like your grandmother. Accelerate slow and don't drive above 65. Accelerating quickly wastes a lot of gas, so notice how quickly you pull away from the stoplights and practice easing on the gas pedal - it feels unnatural at first but will save you money. Also, your car's gas mileage goes way down when you drive beyond 60mph (55mph being the optimal driving speed) so slow it down a bit. Try leaving a few minutes earlier so you don't have to rush when you get in your car. This can also help prevent accidents, which can be quite costly as well. 2. Check your tire pressure. In the winter, the air condenses and your tire pressure goes way down. I checked my tires last week and they were only 2/3 as full as they should be. If you haven't checked your tires yet this winter season, you are probably in the same situation. Check the dpi number on your tires and then go to your local gas station and fill your tires (and if you live near Reading, PA check out a Wawa for free air pressure nozzles). 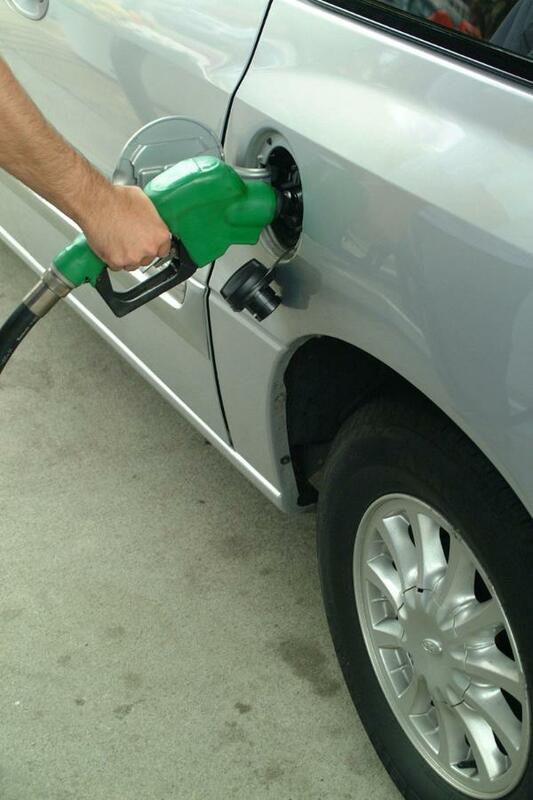 Filling up your tires makes a huge difference in gas mileage and will absolutely save you money. 3. Take some weight off. Lose any extra, unnecessary stuff you're carrying around in your car or trunk, it's only hurting your mileage. In the winter when your car is covered in ice and snow, scrape it all off, that stuff is heavy! Don't forget to get rid of your roof rack when you're now using it, it adds drag to your car and decreases mileage as well. 4. Get tuned up. Small things like getting the check engine light diagnosed and fixed, changing your oil and air filters in a timely manner, and doing little needed repairs can make a huge difference on your gas mileage. If your car is working well, it will run more efficiently and use less gas. 5. Consider getting a gas card. If you frequent a gas station, look into the gas card they offer and its rewards. Your loyalty might just save you a few bucks. I personally use the Discover Open Road credit card that offers 2% cash back on gas purchases and restaurant dining. It may not be much, but it's something I can put back in my wallet. And something is better than nothing. 6. Don't settle for the first gas station you see. Notice gas prices when your tank is getting low and go for the cheapest one that's on your way. You can also check out gasbuddy.com or download an app that tells you which stations near you have the cheapest gas at the time. For more thrifty tips than you see here, "like" The Thrift World on Facebook in the upper left-hand corner. Drive safe thrifters!